Everyday EF Solare Italia takes part in the discussion on the main energy and renewables issues, promoting accurate information dissemination. EF Solare Italia is the largest owner of solar energy plants and the third PV operator in Europe with nearly 800 MW capacity. The photovoltaic industry is experiencing an intense season of technological evolution, in parallel with the growth of production and installations. By revamping we mean a modernization of a tech plant aimed at prolonging its operational life, recovering its maximum efficiency. EF Solare Italia takes part at EnergyMed 2018:a conference curated by EF Solare Italia that deals with Photovoltaics 2.0 from incentives to decarbonisation. Sara Di Mario, our COO, delivered a speech at Solar Asset Management Europe by Solarplaza. Sara Di Mario, COO of EF Solare Italia, has delivered a speech in the AEIT International Annual Conference 2018. Our COO, Sara Di Mario took part in the Roadshow organized by Elettricità Futura. The participants of the 19th edition of Master in Energy Resources Management organised by SAFE have visited our PV plants in Nepi. Our CEO has delivered a speech in the workshop about renewable sources organised by SAFE. Our CEO has met the participants of SAFE Master. The participants have visited our PV plant “Castelluccia”. EF Solare Italia has organised with the energy & Strategy Group a round table ” The Italian PV’s optimisation: problems and solutions”. 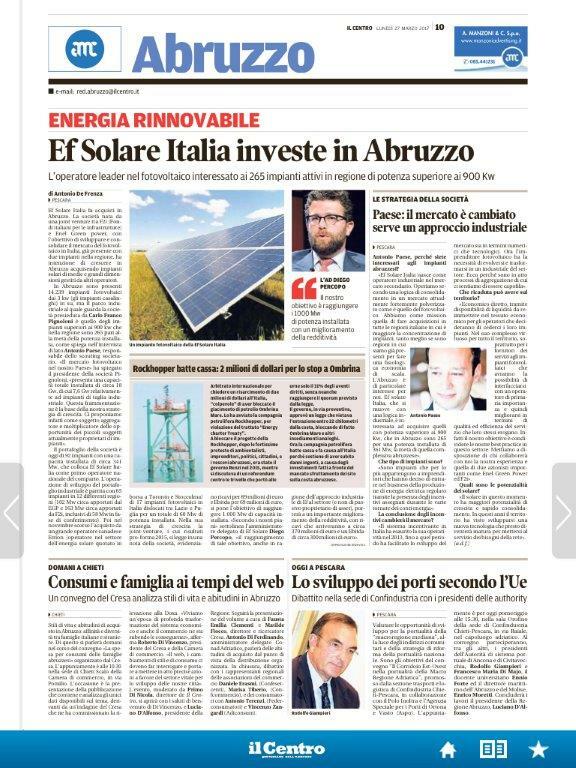 EF Solare Italia is proud to be a partner of this project. 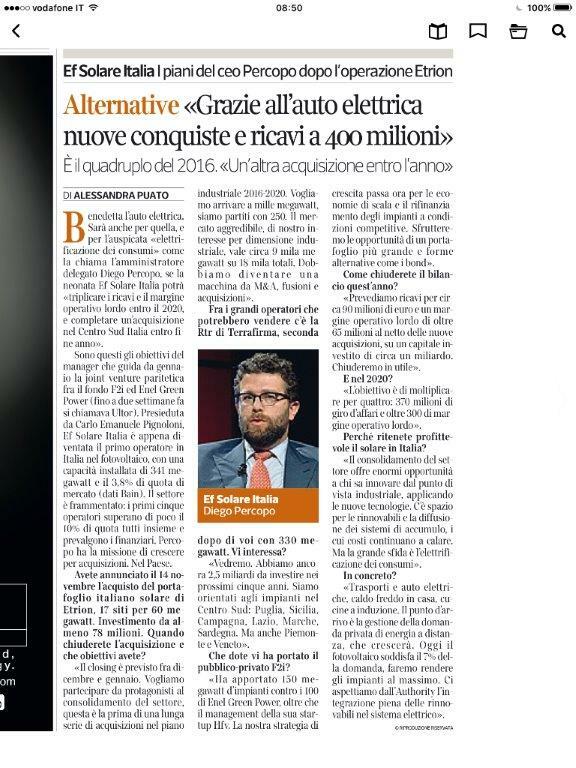 Our CEO Diego Percopo took part in RoadShow organized by Elettricità Futura. On 31st May EF Solare Italia has organised a lesson for the participants of SAFE Master. Diego Percopo delivered a speech at the presentation of the OIR 2018 by Agici. Diego Percopo, CEO of EF Solare Italia, delivered a speech at the presentation of the Renewable Energy Report 2018 by Energy & Strategy Group. 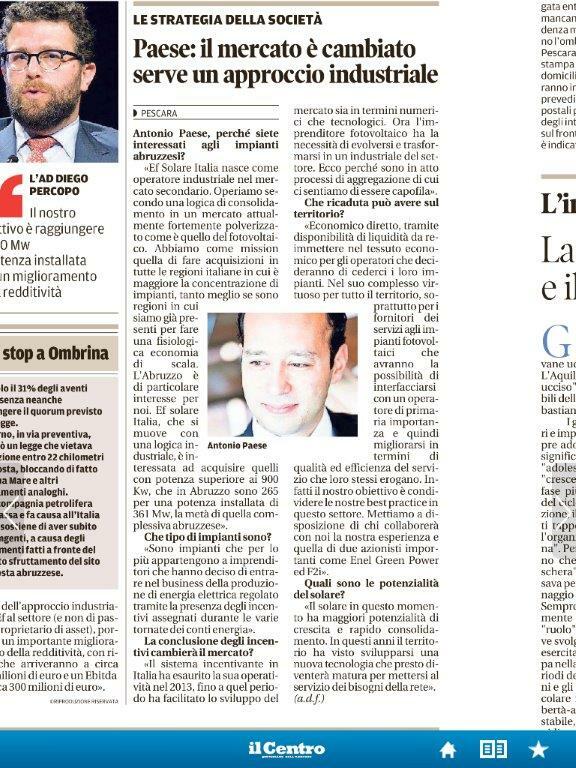 Diego Percopo, CEO of EF Solare Italia, delivered a speech in a conference: “The Operators’ strategies: from renewal to new investments up to 2030“. From 5th to 7th April 2018, the 11th EnergyMed edition, the exhibition-conference on renewable sources and energy efficiency in the Mediterranean, took place in Naples. Sara Di Mario, our COO, delivered a speech in the DuPont Photovoltaic Solutions’ event. Our COO Sara Di Mario and Giuseppe Noviello, EF Solare Italia’s Member of the Administrative Board, delivered a speech in the AEIT Annual Conference. During the presentation of Bax Energy independent innovation campus CEO Diego Percopo delivered a speech. During the workshop our CEO has delivered a speech. EF Solare participated in the 5-a-side football competition, together with the main energy sector institutions. The main energy sector event turns 10 with a special edition. Renewables in Italy: new markets and revamping potential. The photovoltaic sector consolidation in Italy: legal, technical and financial aspects. Conference organised by Holding Fotovoltaica S.p.a. in collaboration with AEIT and GSE, 24/11/2016 at GSE. From 30th March to 1st April 2017 the 10th EnergyMed edition, the exhibition-conference on renewable sources and energy efficiency in the Mediterranean took place in Naples. IREX Annual Report 2017, at GSE on 11/04/2017. Organised by Green Arrow Capital, at GSE, on 02/05/2017. Everyday FAI is committed to protect and open to the public all the wonderful natural, cultural and artistic gems spread all over our countryside, cities and coasts. Established by the merger between Assoelettrica and AssoRinnovabili, it represents and protects all companies operating in the electricity sector in Italy. Non-profit organisation promoting clean energy solutions in the Mediterranean Countries. A global professional network in the renewable energy sector. Master course in Energy Resources Management, where EF Solare Italia is involved in training projects. Master in Energy Efficiency and Renewable Energy Sources, established by Sapienza University in Rome, our partner. 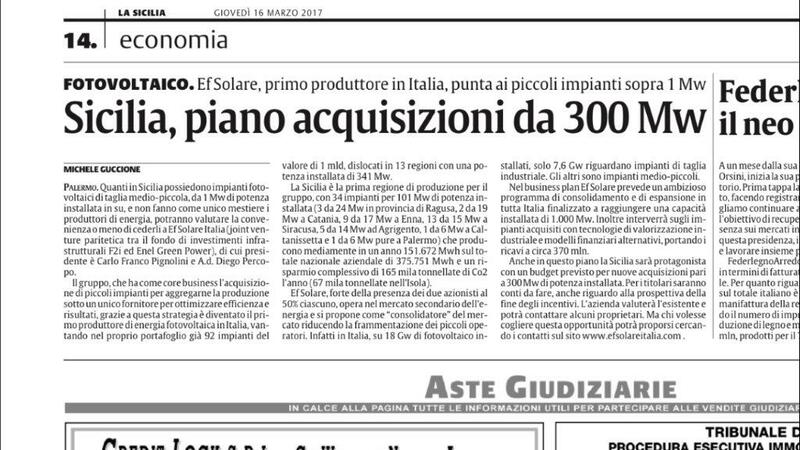 EF Solare Italia buys a PV plant with 2.5MW. EF Solare Italia’s leadership in PV sector grows up.